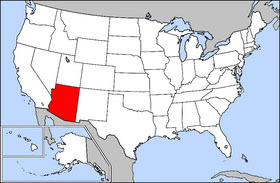 Arizona was the 48th state admitted to the United States and is part of the Southwest United States. It is one of the Four Corners states, south and east of the Colorado River, bordering New Mexico, Utah, Nevada, California and Mexico. Its major cities are Phoenix, Tucson, Yuma and Flagstaff. Besides the Grand Canyon, a number of other National Forests, Parks, Monuments and Indian reservations are located in the state. Spanish derivative, "arizonac", of the Pima or Papago word "al shon" or "aleh zon" meaning little or young spring. Arizonac is a small town about eight miles south of the United States-Mexican border. Its name was probably derived from the Pima or Papago name for the place. In 1736 a small silver-mining camp called "Real Arissona" by the Spanish was established near the town. Later in the mid 18th century Spanish missionaries changed Father Eusebio Francisco Kino's maps of the area; they renamed the town Arizonac as Arizona. As the maps were republished and circulated in Europe, the name Arizona became attached to the whole northern part of New Spain. State nicknames "The Grand Canyon State" or "The Copper State"
State Songs "Arizona March Song" and "Arizona"
Beyond its original native inhabitants, Marcos de Niza, a Franciscan, explored the area in 1539. Coronado's expedition entered the area in 1540-42 during its search for Cibola. Father Kino developed a chain of missions and taught the Indians Christianity in Pimer�a Alta (now southern Arizona and northern Sonora) in the 1690's and early 1700's. Spain founded fortified towns (presidios) at Tubac in 1752 and Tucson in 1775. All of what is now Arizona became part of Mexico's northwest frontier upon the Mexican assertion of independence from Spain in 1821. The United States took possession of most of Arizona at the end of the Mexican War in 1848. In 1853 the land below the Gila River was acquired from Mexico in the Gadsden Purchase. Arizona was administered as part of the Territory of New Mexico until it was organized into a separate territory on February 24, 1863. Arizona's executive branch is headed by a governor elected for a four-year term. The governor may serve any number of terms, though no more than two in a row. The current Governor of Arizona is Janet Napolitano, a Democrat. She has been governor since 2003. Napolitano was born in New York City, moving to Arizona after graduating from law school in 1983, whereupon she clerked for a U.S. Appeals Court judge before joining a Phoenix law firm. She became a partner in 1989. She was appointed United States Attorney for the District of Arizona by President Bill Clinton in 1993. In 1998, Napolitano was elected as the first female Attorney General by Arizona voters. During this time, she prosecuted a number of cases -- many backlogged -- and established herself in the eyes of many voters as a guardian of children, the elderly, women, and the environment. The two Arizona US Senators are Senator John McCain (Republican) and Senator Jon Kyl (Republican). Arizona's representatives in the United States House of Representatives are Rick Renzi (R-1), Trent Franks (R-2), John Shadegg (R-3), Ed Pastor (D-4), J.D. Hayworth (R-5), Jeff Flake (R-6), Raul Grijalva (R-7), and Jim Kolbe (R-8). Arizona gained two seats in the House of Representatives due to redistricting based on Census 2000. Early in its history, Arizona's economy relied on the "five C's": copper, cotton, cattle, citrus and climate (i.e., tourism). At one point Arizona was the largest producer of cotton in the country. Copper is still found in abundance from many of its small mining towns. (See, for instance, Bisbee, Ajo or Globe.) While the state government itself is the state's largest employer, Wal-Mart is the state's largest private employer with 17,343 employees in 2003. Arizona lost much of its advantage as a high-technology industry leader between 1990 and 2001, according to a state Department of Commerce (http://www.commerce.state.az.us/) report. In 2001, 161,166 Arizonans were employed in the high-tech sector, accounting for about 8.3 percent of total private-sector employment of more than 1.9 million. High-tech payroll in 2001 was $2.2 billion, or 14.7 percent of the private-sector total. High-tech employment was led by software and computers, with 34,314; electronics components manufacturing, 30,358; aerospace manufacturing, 25,641; architectural and engineering services, 21,378; telecommunications, 21,224; and instruments manufacturing, 13,056.